LINE-X of Boise is here to provide exceptional results for private and commercial drivers across the state. We are proud to rely on a premium product to offer unsurpassed protection, but often field a lot of questions. Here are some frequently asked questions from our customers. Do I have to let my LINE-X spray cure? No! 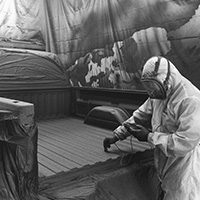 Our spray-in bed liner cures in roughly five seconds, allowing you to make the most of it for all light-duty applications. Boise drivers can leave our truck shop with a system that is ready to handle any and all tough jobs, whether that involves washing the entire vehicle, stocking the bed full of groceries, and more. How long do I have to wait for heavy-duty use of my bed liner? LINE-X of Boise recommends waiting 24 hours before putting our finish to the test. After one day has elapsed, you can expect your spray to cure fully, delivering ideal protection that is designed to last a lifetime. Do I need to prepare my truck for LINE-X sprays? We recommend cleaning your truck’s bed and clearing it of any accessories before you bring it in. Any product that did not come factory-installed with the truck should be removed to reduce the service time, including tool boxes, tonneau covers, and more. Can you apply LINE-X if it is raining or snowing? Our state is known to host intense weather patterns, making it difficult for drivers to plan their professional spray coating services. You can bring in your vehicle in any weather, and our team will get to work heating and drying each surface to perfection. How long does it take to install LINE-X? We employ the most skilled powder coating specialists and protection experts, and will be able to deliver an exceptional result in a couple of hours. Each vehicle is unique, so be sure to contact us for an accurate quote for your truck! Will I need to make changes to my bed’s drain holes? No! Unlike drop-in bed liners, which come in rigid styles that do not perfectly match each vehicle, LINE-X conforms to every curve and contour. This leaves your existing drainage system in place. Does LINE-X heat up faster than the rest of the vehicle? One question we field here concerns how comfortable our spray-on bed liner will be to the touch on a sunny day. The color black absorbs a lot of heat, and is often associated with inhospitable surfaces. Since LINE-X bonds to the metal of your vehicle, heat can efficiently transfer outward, providing a touch that may actually feel cooler compared to the metal. Yes! If for some reason your spray-in bed liner does sustain damage and require repairs, you can take it to any authorized LINE-X dealer. Bring your truck to our shop in Boise, and our team will be able to provide fast, effective repairs to restore the protection and look of your vehicle’s finish. What is my warranty coverage for LINE-X sprays? This product is backed by a Limited Lifetime National Warranty. If your LINE-X coating begins to peel, bubble, flake, blister, or suffer from any other defects, bring it into one of 400 dealers across the country. Have questions that we have not answered here? Ready to schedule your spray coating service? EPSCO Powder and Industrial Coatings and LINE-X of Boise are here to provide the best protection for vehicles of all types. We have the expertise, experience, and truck accessories needed to outfit your vehicle for a durable and beautiful result. Contact us online to learn more, or fill out the form below to get started!